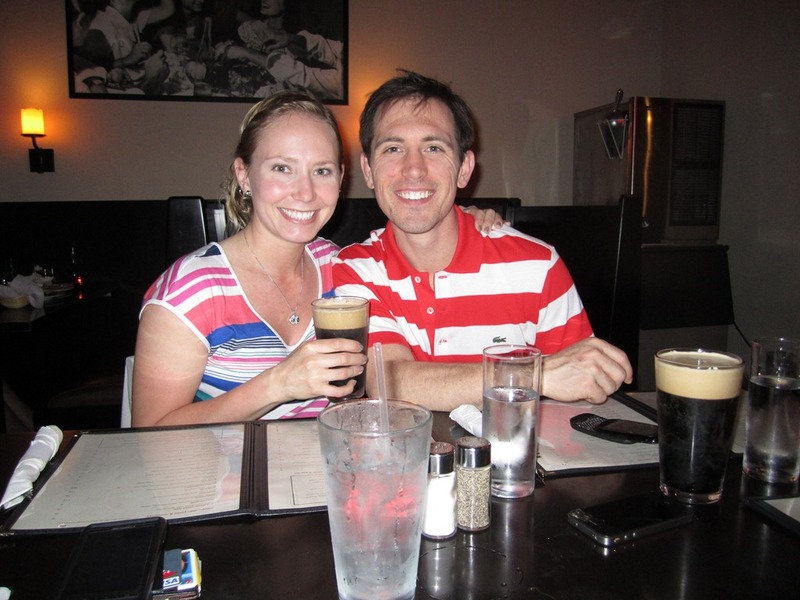 Friday, we joined up with some friends after climbing and headed to Red Rocks Pizzeria for some pizza and a beer. I switched purses earlier and of all the things to forget, I forgot my drivers license! I was totally bummed, thinking that of course she would card us and that I wouldn’t be able to get a beer. As everyone started ordering, I threw in my order as well and she didn’t card us! So I was able to get my beer! haha! I ordered the Left Hand Milk Stout (yes I’ve had this many times before) but it was on nitro tap! And I had to see if it made any difference and had any effect on the beer. Yes it did. Negatively. I was really surprised, but the beer was nowhere near as good! Its nice that it was super creamy and smooth, but all the good flavors seemed to be gone! I was almost embarrassed because someone else who also ordered the beer asked my opinion and I, of course, talked it up! It was still a tasty beer, and we had a great time, and shared some great pizzas! It was such a beautiful spring Thursday that we decided to go for a motorcycle ride around DC and see the cherry blossoms! But when we got downtown it was crawling with tourists and people. There was no way I wanted any part of that. So we kept riding. Heading through a somewhat people empty area of downtown I caught a glimpse of something just as good as cherry blossoms and made Jack park the bike. 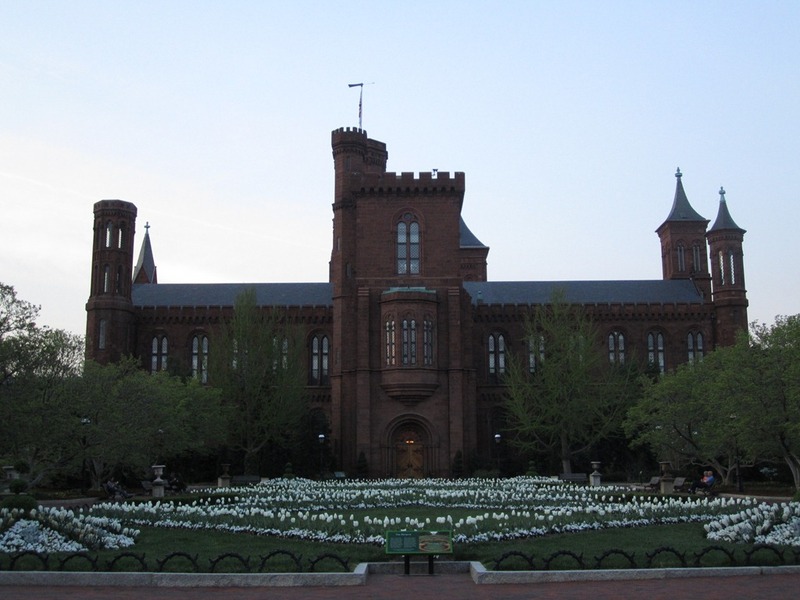 It was the backside of the Smithsonian Castle! 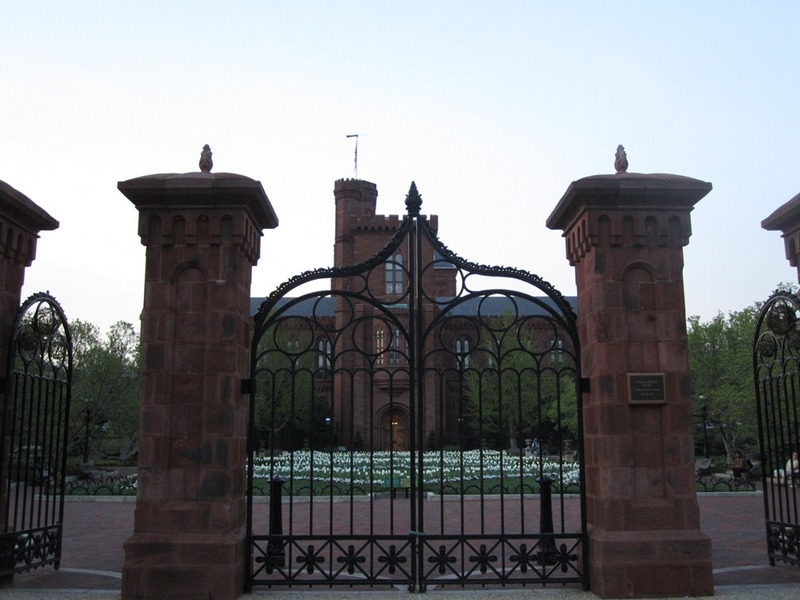 The Smithsonian Castle was the original museum back in 1847 but now houses the administrative offices. Its beautiful! The best part was, that there were only one or two other couples quietly sitting on benches. We found a good bench, and admired the view for quite a while. Then we got back on the bike and headed over to Brasserie Beck for appetizers and a beer! They have a really good beer menu and I found a beer I’ve never tried! 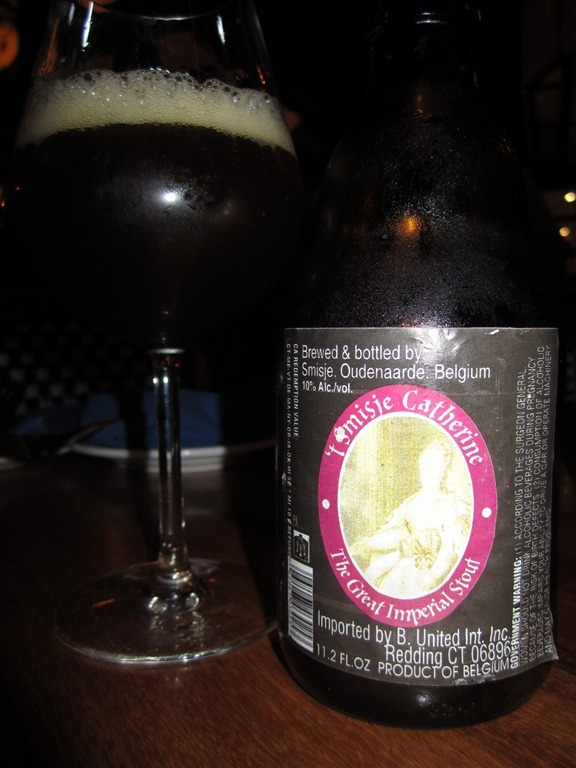 I ordered the Catherine the Great Russian Imperial Stout by Brouwerij Smisje of Oudenaarde, Belgium at 10% abv. I was intrigued to find a Belgian Russian Imperial Stout. It seems like most Belgian beers are dubbles, tripples, and quarduples, all being as close as possible to Abbey beers. With of course the odd exceptions of Gueze and Lambics. So I had to try it. It wasn’t very stout-like. But it was fantastic! Poured dark, but with reddish hints. Sweeter than most stouts, but not as sweet as many Abbey beers usually are. Dark fruits, figs, raising, and spice. Almost peppery and somewhat dry. I would call this a mild stout, but certainly not a Russian Imperial Stout. It was right up my alley though. 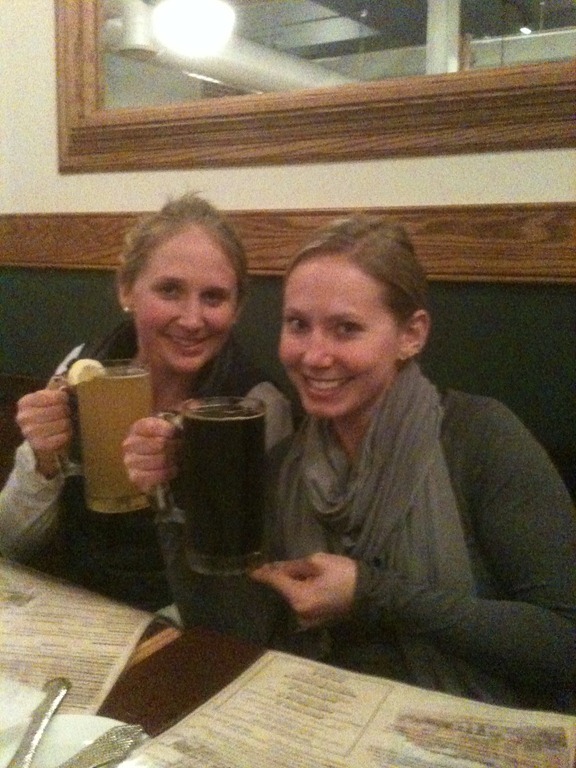 I would definitely order this beer again. Dinner, beers, and I make dessert! So happy Amber was in town! Of course Jack and I had dinner at our place! Liz, Amber, and Ryan were all able to make it! Amber and I ransacked the fridge and found two beers that had been there for a while and just had to be drunk. 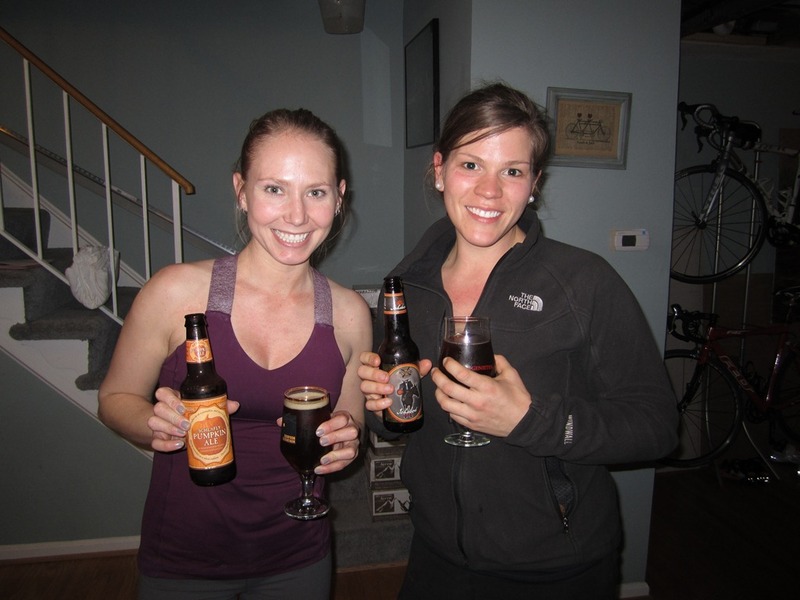 Oddly enough they were both pumpkin beers. Really quite the opposite flavors for spring. But somehow they worked well with dinner. I had the Schlafly Pumpkin Ale by the St. Lewis Brewery of St. Lewis, Missouri at 8% abv. This is the best pumpkin beer I’ve tasted. Yes it’s really pumpkiny. It has all the spicing of a pumpkin pie, cinnamon, nutmeg, cloves. But I think what actually makes this beer better than the many other pumpkin beers is that they actually start with good, drinkable beer. The beer minus all the spices and pumpkin is of a better quality than many of the other brands. I’ve had many pumpkin beers that has horse piss beers with light pumpkin flavor. Obviously this does not make them any better. But this Schlafly Pumpkin Ale is actually decent beer, and tasty! Anyway, I was very excited because I actually made dessert! 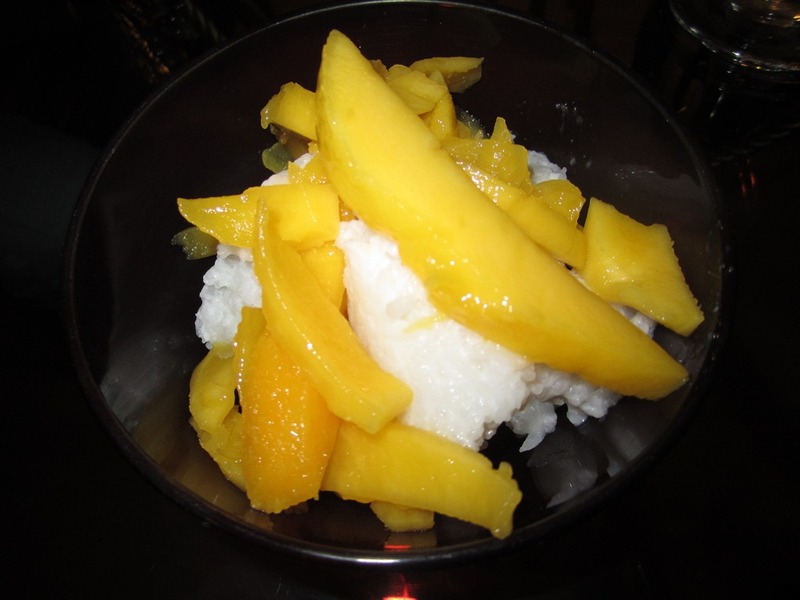 I made Mango Sticky Rice! The rice is made and soaked in sugar and coconut milk. Sliced mango on top and its amazing! 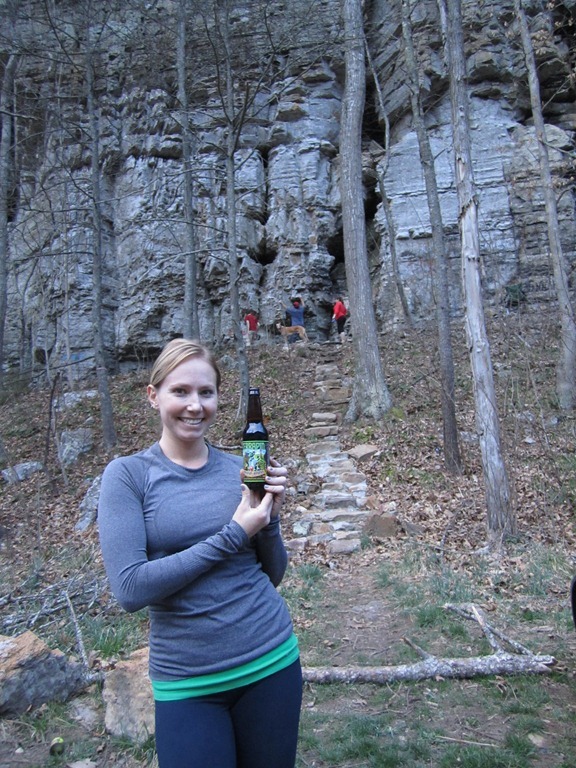 After a good Thursday night of climbing, I felt the weekend calling and had to have a beer with dinner! 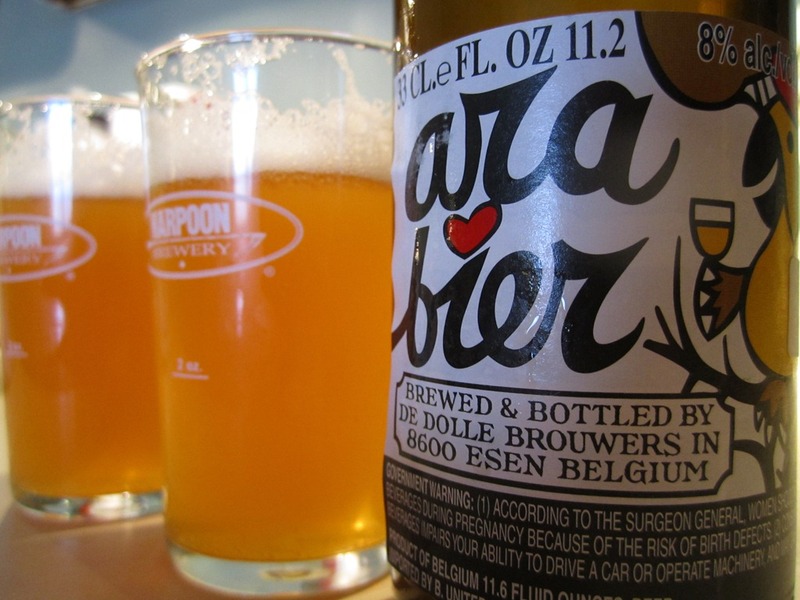 Jack and I split the Ara Bier by Brouwerij De Dolle Brouwers of Esen, Belgium at 8% abv. I usually go for darker Belgians and Quads, so this was a lighter treat! Beautiful Belgian yeast, kind of spicy. And hoppier than I was expecting! Light fruit flavors like lemon and apricot. A slight bitterness towards the end but quite smooth. I love De Dolle, their beers always impress me! Great way to kick off the weekend! Saturday, to kick off Amber’s week of spring break in DC, we had girls night at Liz’s! 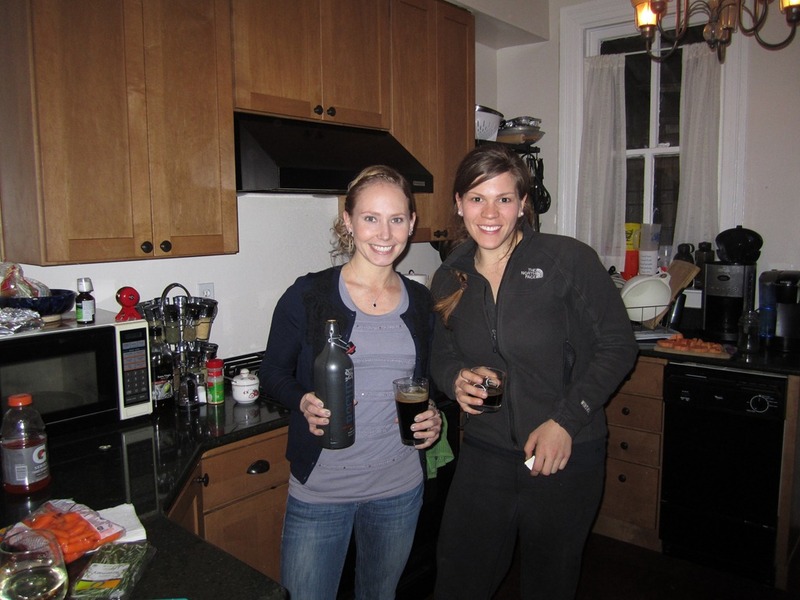 We made specialty pizzas, and had wine and beer! Amber brought the ingredients for my favorite pizza ever from Pies and Pints Pizzeria in Fayetteville, WV (where we go climbing at the New River Gorge). We recreated the Grape Pie! It has sliced red grapes, gorgonzola, and rosemary. Of course I brought a beer that I was very excited to try. The Rogue XS Imperial Stout by Rogue Ales of Newport, Oregon at 11% abv. Quite good, but a bit of a bite for me. More hoppy than I realized. Yet still smooth with hints of chocolate. Sort of bitter sweet espresso flavors. Thick and chewy. A good Russian Imperial Stout. Somewhat expensive for a big bottle, so I doubt I will be picking it up again soon. Back in March, we made our way over to Pablo’s for some snacks and beer! I brought Pablo a beer, but I also brought a big bottle that I had been eyeing in the fridge for a while. 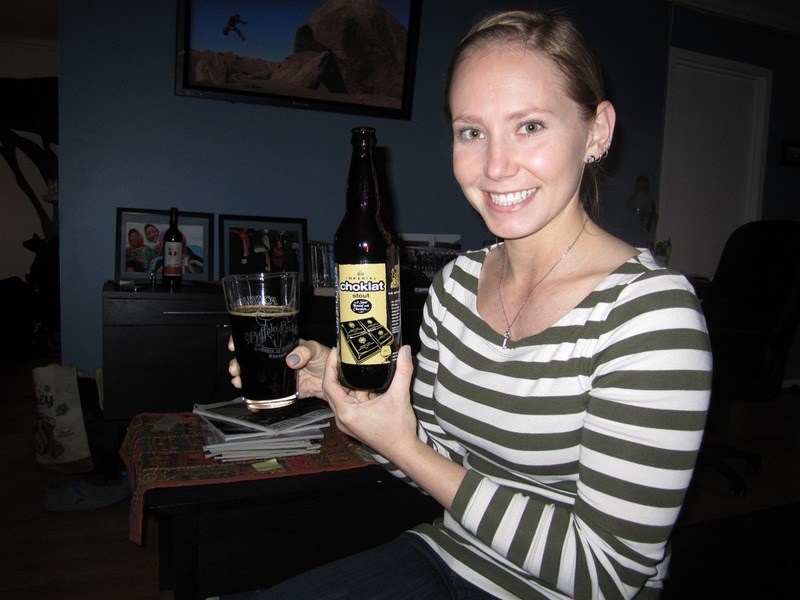 I had the Southern Tier Choklat Stout by Southern Tier Brewing Company of Lakewook, NY at 11% abv. This beer was gone before I knew it! Pours very dark, not overpowering chocolate. Light milk chocolate. Thankfully low carbonation, medium mouthfeel. I could drink this beer anytime, anywhere.